During National Social Security Month, we encourage people to take control of their future with my Social Security. Create a my Social Security account to check your earnings history, confirm you have enough credits to retire, see an estimate of future benefits while still working, or manage your monthly benefits once you begin receiving them. You can also check the status of your claim or appeal, request a replacement Social Security card, and get an instant benefit verification letter. 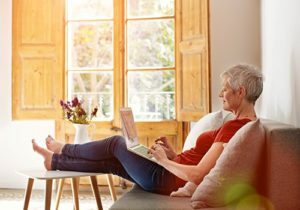 Our Retirement Estimator is another great tool that provides you with immediate and personalized benefit estimates based on your own earnings record. This allows you to receive the most accurate estimate of your future retirement benefits. Estimate your benefits now. After you have viewed your earnings history for accuracy, confirmed you have enough work credits to retire, and determined the best age to retire, you can get started on the next phase of your life right away by retiring online! It’s fast and easy on our website. For more than 80 years, Social Security has changed to meet the needs of our customers. During National Social Security Month, and throughout the year, Social Security puts you in control with secure access to your information anytime, anywhere. From estimating or managing your benefits, requesting a replacement Social Security card, to retiring online, visit SocialSecurity.gov today, and see what you can do online. This entry was posted in National Social Security Month, Online Services and tagged benefit verification letter, benefits, my account, My Social Security, my social security account, my SSA, national social security month, NSSM, retire, retire online, retirement, retirement benefits, Retirement Estimator, Social Security benefits, Social Security credits by Jim Borland, Acting Deputy Commissioner for Communications. Bookmark the permalink. We need a decent increase. I am so very thankful I live in the USA and we have the different programs here to help when its really needed! Other countries take care of their families and their government do not take care of them. So I am not going to complain one bit….Be thankful!! I’m in agreement with this, but for even more. The pitiful increases of 2% and 3% are not in line with the actual cost of living each year. Also, the Food Stamp Program is a joke! I qualify for $12…..hey its something! i am interested in learning how to interact more frequently as my benefits should activate by june 2018, i understand there are income limits and already know i probably will go over the 17,100$ ,without being diagnosed disabled, but having permanent back problems, i will have to notify the ssa of my income to avoid overpayment, do i have a online recourse to help ssa determine proceedings for this issue? Call SS @ 800-772-1213 and give them a corrected earnings estimate. I AM NOT SURE WHAT YOU TELL YOU I GET $260.15 $857.00 . Sad to see most of the increase going to Medicare. People need the increase. They have earned this. Will the monies be replaced that the Clinton admin. removed? They must be held accountable. SS is no COOKIE JAR for everyone in government. Pray this reaches the proper authorities. I hope your message reaches those in charge, and that they have a conscience about how those of us who paid into the system are being raped by those who are taking our Social Security from us for their own benefit and for the benefit of foreigners who have not paid into the system. What’s up with that? Why is Social Security in debt? It’s because the different departments of our government are taking from it to support their projects and their raises while the rest of us suffer! Social Security is an earned right.It is a social insurance program enacted over 80 years ago, and has always paid its required benefits to those who have earned them. It was enacted to provide the basic financial protection for working people and their families when earnings are lost due to retirement, disability, or death. Benefits may be paid to the spouses and children of workers. They are an earned benefit and ar not paid unless they were earned. Benefits may be paid to those who come to America from foreign countries, like my grandparents, if they qualify by working the required number of years to earn the benefit. No foreigners who have not paid into the Social Security System for the required number of years can collect Social Security. No department of the government can use any money in the Social Security Trust Fund for its own purpose. The Social Security Trust Fund is funded by employee and employer contributions in the safest investment in the world US Treasury Bonds. These contributions and investment returns as I have said have met their obligations to working people for over 80 years. As a matter of fact several years ago a poll asking which of the thousands of laws passed in American history are the most popular the Social Security law of 1935 came in in the first 10. Social Security was not designed to solve every financial ill possible, it was designed to give a financial leg up to workers and their families in case of retirement, disability, or death. I will be 70 on December 2, 2018. How soon do I need to apply to start receiving SS payments beginning on December 2, 2018? You can apply now by using the interactive screens that SSA provides on their web-site or by calling 800-772-1213 and either filing or setting up an appointment. There is no retroactivity so you should apply now and not wait or you will lose money. You can/should apply 2 months in advance. I’m concerned that you have not addressed the issue of those of us who had to file for Social Security early due to the Recession. Since the U.S. Government bailed out corporations and big business, how come our government have not reinstated those of us who had to file early because of the 2008 Recession. I lost my job during the Recessing, lost my home in the process which was to be part of my retirement, and I ended up homeless for 2 years. When I could not get a job, due to my age, among other things, I was forced to file for Social Security, and Social Security took more than half of what I was entitled to receive at age 65. I already wrote the President of the United States, and his reply was how the Cost of Living is calculated, which did not answer my question at all! I know I was not the only one caught in this scenario, and I want to know what can be done about it. Please! Absolutly nothing. The issue you raise is no issue at all. Happy SS Month! You’re supposed to take your meds 3 times a day, not one a day. Congratulations to all of those that are and have been employed by the Social Security Administration. It is indeed an invaluable secondary (and in many cases primary) source of retirement income. Unhappily, the current administration as have others before it are adamantly attempting to privatize and reduce its ability to help those reliant on this source. I hope that everyone will continue to ensure that it continues to provide resources to current and future beneficiaries in the years to come. No one, and I repeat no one is seriously thinking about privatizing SS. It has been discussed and that is all. To say that this administration or prior administrations have actually attempted anything is a canard. Because I’m a retired teacher in Massachusetts, I will lose most of my Social Security even though I had all my quarters in before I became a teacher. Why is this considered double dipping when it is the government who double dipped on me??? Benefits are skewed toward giving lower paid workers a higher percentage of SS when compared to their earnings. Since you were a public employee it appears that based on your SS earnings history that you were a lower paid worker when in fact you were not. You were paying into another system. Why should you get as much as someone who worked and made minimum wage all his life? Great to have a social security month. I lost over a1/3 of my income in 10 years. I heard we all were getting new designed SS cards..Is this true?.. No, we’re getting new Medicare cards which do not have a SS number on them. It is also National Poetry Month, so what?? Now if they could get their act together after over a year they still do not have my social security right. Filed the paperwork and made several calls but they say they are busy. The SSA has been deliberately underfunded by Congress, and there had been (still is?) a hiring freeze. Each person in these local offices is doing the work of 3. Another way the GOP-controlled Congress is trying to gut the program. I need $250,000.00 to purchase my new property??? I can’t afford that kind of payments so I need some one to give me that much so I don’t have any payments??? How about a $250,000.00 Grant ??? That I don’t have to pay back??? I don’t understand why I have all of my quarters in and I still can’t receive full benefits because I draw teacher retirement. Who gets all of my money that I paid into Social Security. The GOP and Trump SOB is dying to gut Medicare, Medicaid, food stamps, SS. All that many survive to live on so they can fatten their wallets. WE MUST VOTE THEM OUT!! !!!!! Also, the politicians owned by NRA must be voted OUT too. Watch MSNBC and CNN. Addicting ! WHAT DOES MEANS!! SOCIAL SECURITY ALL CITIZENS DESERVE TO COVERAGE FROM THIS WORD SOCIAL SECURITY.. Thanks for making this important information accessible. I KNOW SOCIAL SECURITY IS VERY FIXABLE! EVERYBODY PAYS INTO S. S. NO CAP’S FROM THE PRESIDENT DOWN. I live in Glencairn Hts. Simons Town, South Africa, 7975. I am to receive my social security benefit payment no later than the 3rd of every month. Today is 5 April and I still have not received it. Why? I’m 62,next week,signed up for early retirement. Won’t be much ,been caring for my elderly mother with cancer and macular degeneration and helping sister with Ns. For years.Doing all the driving ,some of the cooking, housework, yard work,and shopping.! Any supplemental income for me? Also I recently had melanoma surgery! SSDI? We appreciate your thoughts, Kenny. Thanks for your comment! Got my temporary password. Still can’t access my SS account? Hello Karen. Social Security Disability Benefits are paid to people who are unable to work because of a medical condition that is expected to last one year or more or to result, end in death. Social Security pays only for total disability. No benefits are payable for partial disability or short-term disability. We pay disability benefits through two programs: the Social Security disability insurance program (SSDI) and the Supplemental Security Income (SSI). The Supplemental Security Income (SSI) program is a needs-based program that pays benefits to disabled adults and children who have limited income and resources. SSI benefits also are payable to people 65 and older without disabilities, who meet the financial limits. Social Security Disability Insurance (SSDI) benefits, on the other hand, are based on your years of work and recent earnings, and are not subject to income and resource limits. If a person thinks that he or she meets our definition of disability, we encourage them to apply for disability benefits as soon as they become disabled. You can apply online, which is quick and easy. For more information visit our “Frequently Asked Questions” web page on disability. Is it true that Social Security cards are being reissued this year (2018)? I’m 62 and currently waiting on my appeal for disability. Can I file for SS in the meantime without affecting my disability appeal? We are getting desperate. I worked for Federal Government agencies for 30 years. After my having suffered a major stroke in 1994, I was no longer able to work. At the time of the stroke, I had not earned quite enough needed quarters to be eligible for receiving social security. When I was growing up and working and living in South Carolina, with my having to work and provide for my mother an my sisters and brothers, I was not paying social security, which is now causing me to suffer. Can I be helped at all? Hello Hattie. The Supplemental Security Income program pays benefits based on financial need. Please call our toll free number at 1-800-772-1213 and speak to one of our agents. Representatives are available Monday through Friday, between 7 a.m. and 7 p.m.
Also, some individuals may also be eligible to receive social services from the state in which they live. These services include Medicaid, free meals, housekeeping help, transportation or help with other problems. You can get information about services in your area from your state or local social services office. Or you can visit the U.S. Department of Health and Human Services web page for more information.